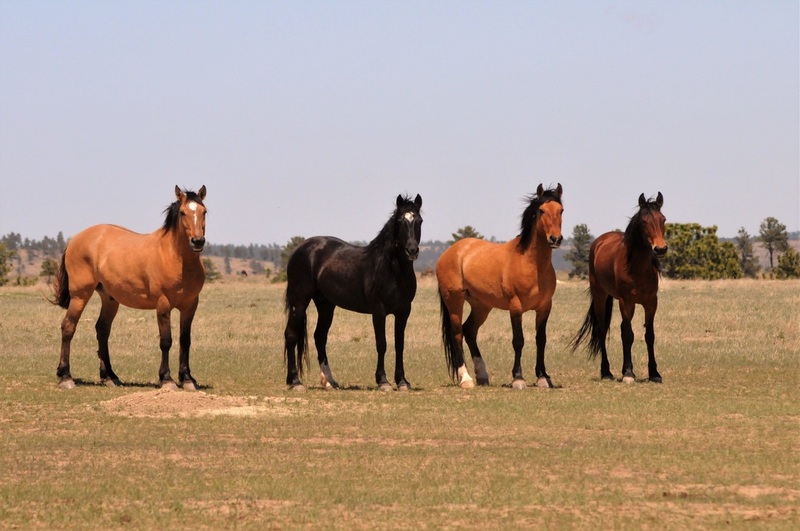 Everything we do at the Black Hills Wild Horse Sanctuary is devoted to the horses. From BLM horses that nobody wanted, to rescued horses in need of a second chance in life, to preservation of breeds of horses that have dwindled to near extinction... it's all about the horses. The Black Hills Wild Horse Sanctuary’s purpose is not solely to provide freedom for captive wild horses. 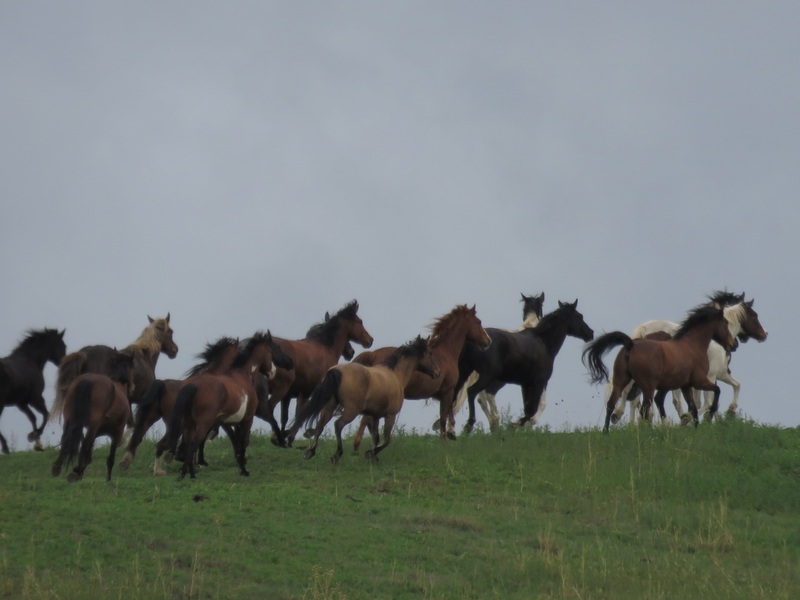 The sanctuary also acts as a research environment-research dedicated to solving the problems of wild horse herd management that will contribute to the well-being of wild horses everywhere. The Sanctuary and its staff are devoted to the spirit of the wild mustang by giving America’s unwanted wild horses a quality life of freedom. The Sanctuary is a showcase where the public can see large herds of wild horses running free and come to understand our efforts toward land conservation and the preservation of our western heritage – American’s Wild Mustangs! 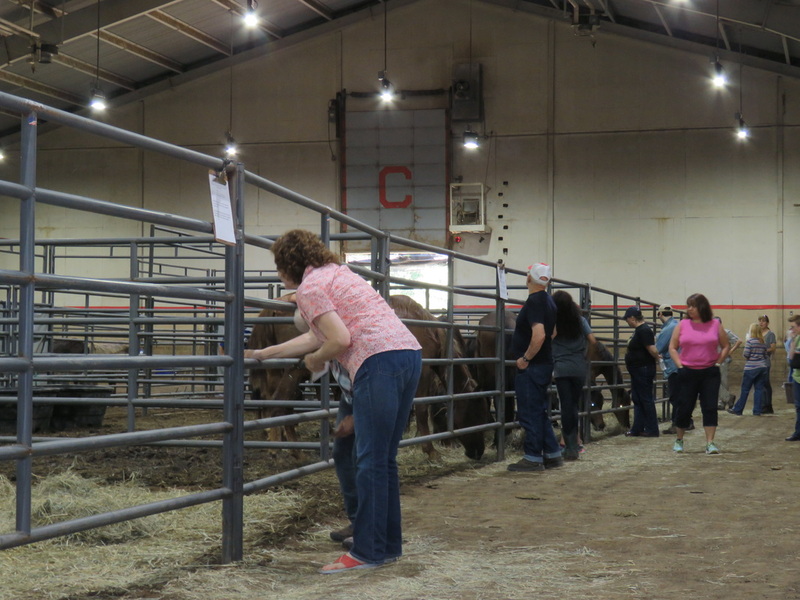 The Bureau of Land Management (BLM) was in Ithaca, NY at Cornell University on June 17-18, 2016 for a wild horse and burro adoption event. It is not a common event to have the wild horses and burros in Upstate New York or the Northeast, for that matter. People came from surrounding states, PA, CT, MA, VA to name a few, to see these living legends of American history. 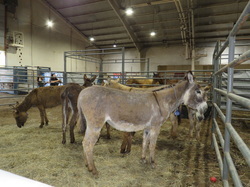 Approximately 20 mustangs and 6 burros were available for adoption. 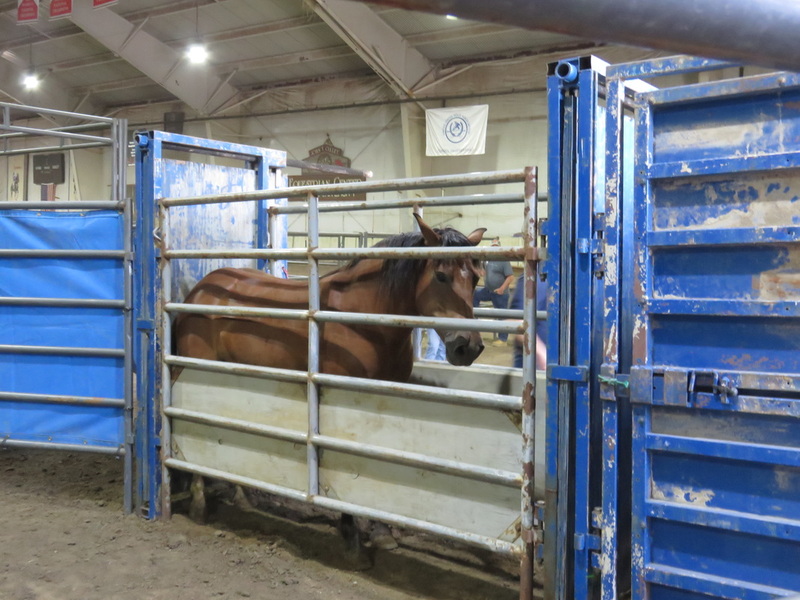 Additional horses that had been purchased through the Bureau of Land Management internet adoption were delivered to Ithaca, NY as a pick up area for ease in picking up their horses or burros on the east coast. If a horse adopted on the internet was not picked up by a specified time on the last day, that animal became available for adoption. ​While the internet adoption is an auction style format, the location adoption was a first come, first served basis. The criteria for adopting a wild horse or burro is the same for either adoption. The potential adopter must fill out an application, provide a diagram and detailed description of the facilities where the animal would be housed then be approved by the Bureau of Land Management PRIOR to bidding on or qualifying to adopt an animal. Specific criteria must be met prior to being approved. As I attended the event fully for both days, it was very exciting to see the wild horses and burros, but also intriguing to see and speak with the people who came to meet them. It dawned on me that the people who gathered to be in the presence of these wild animals were a melting pot, not unlike the horses themselves. It made me realize that these horses who helped shape the fabric of our country and our history were just like the people who shaped the fabric of our country and our history. People who came from different cultures, different backgrounds, different genetics all melting together over time to become something new, something strong, something independent with a desire for freedom. These horses, although originally introduced from the Iberian Peninsula, over time mixed with ranch stock, Thoroughbreds, Saddle Horses, Drafts all melting together over time to become the American Mustang. Why some people label them as feral, mutts, or having less value than a domestic breed, is beyond my comprehension. In my eyes, they are the epitomy of what America represents. They are greater than the individual breeds in their genetics. They are strong, independent, hearty and symbolize our freedom. I think people are drawn to them because of that. I had the pleasure of meeting people who were looking to adopt. People who had adopted in the past. People who just wanted to meet the wild horses and burros. People who had had horses in the past, but no longer did. People who just loved horses and burros and were drawn to them. People were curious about them, wanted to learn about them, wanted to see what the whole BLM Adoption was about. I spent time speaking with the people from the BLM Milwaukee Office who put this event on. I watched them for two days, tending to and caring for the horses and burros. I watched as these scared animals were loaded onto trailers to go to their new homes. I also watched how while these animals were being moved around, loaded and tended to that every single BLM worker and volunteer treated these animals with respect, kindness and tried to keep their stress to a minimum. Above: Before putting a halter on and loading this yearling into the adopter's trailer, Dave, from the BLM Milwaukee Office, took the time to calm this young horse , stroke it's back and lessen its anxiety before its trip to it's new home. 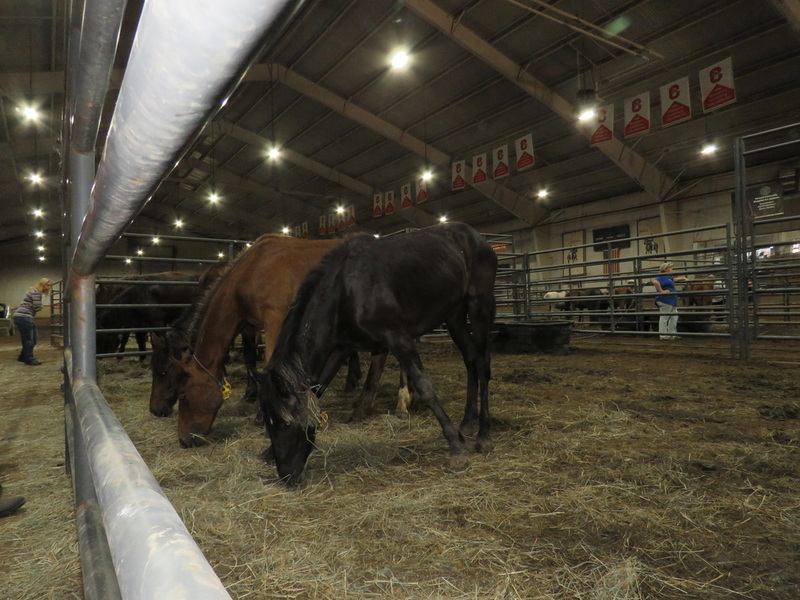 ​By the end of the event, there were 5 wild horses and 3 burros that had not been adopted. Each one of them would now have a “strike” against them. Not because there was anything wrong with them, just because they did not get adopted at that particular event. Once they have three “strikes” they are considered “unadoptable”. There was a three strike Mustang there, I am happy to say, she did get adopted. Let me reinforce the fact that because these horses are labeled “unadoptable” – a term I truly do not like, these are fine horses that would make someone a wonderful partner. DO NOT let that term deter a potential adopter from looking at these animals for adoption. THERE ARE CURRENTLY OVER 50,000 WILD HORSES AND BURROS IN HOLDING FACILITIES. THAT NUMBER CONTINUES TO GROW. CONSIDER ADOPTING ONE OF THESE INTELLIGENT, ATHLETIC, VERSATILE ANIMALS. Freedom and family…these are the most important things for a wild horse. In 2015, Merle lost both. This magnificent Sulphur Mustang stallion was gathered up from his home rangeland in Utah, by the Bureau of Land Management (BLM.) 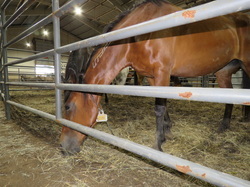 He was separated from his family, branded, gelded, and placed in a feed lot with others who had suffered the same fate. Identified as healthy to be auctioned for adoption, he did not receive any bids. Again and again this happened. He was then labeled as a 3-striker, a wild horse put up for adoption 3 times with no one bidding to offer him a home. The hopes of a 3-striker are grim. It is so hard to imagine Merle in that place while being in the prime of his life. 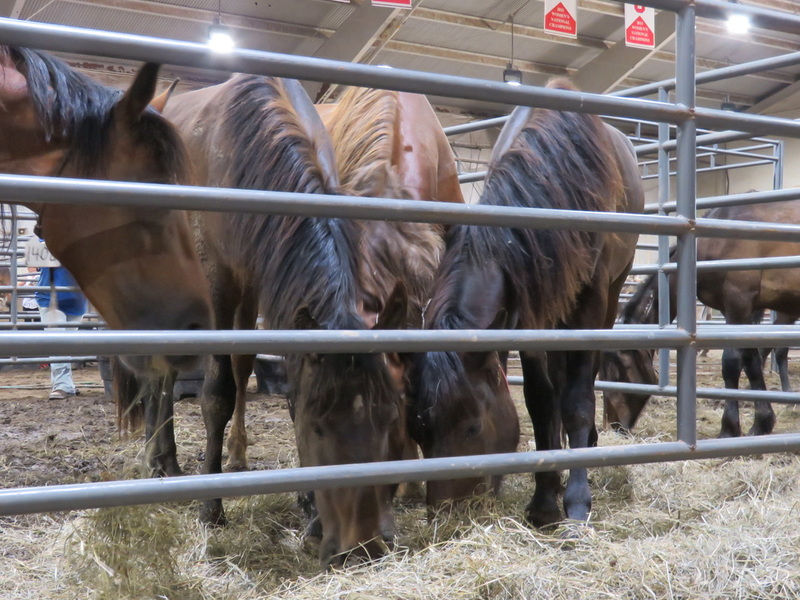 Behind the scenes, some people had indeed noticed Merle and were working with the Black Hills Wild Horse Sanctuary to secure a life-long home for a number of Sulphur mustangs in the same predicament as Merle. In the years since, more than 1,000 wild horses have found life-long freedom and safety at the sanctuary. 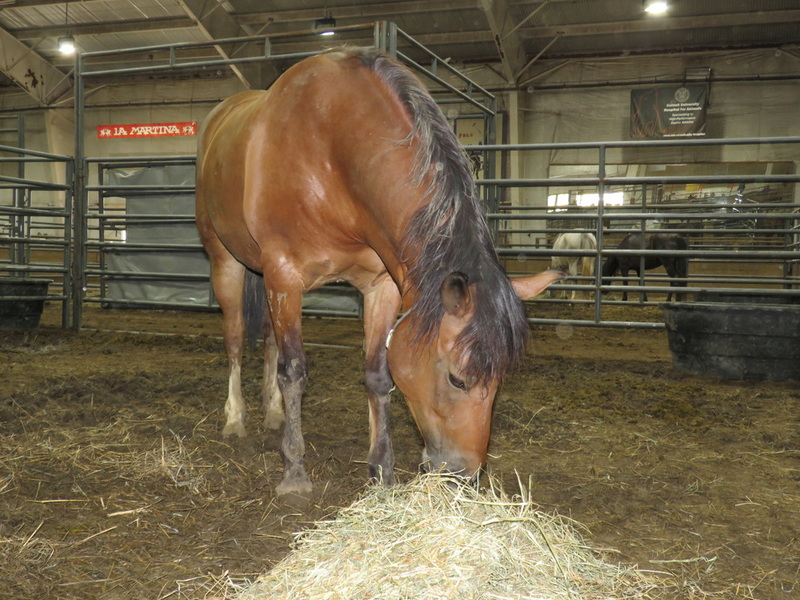 Merle arrived in the second half of 2015 with other Sulphur mustangs. He was so close to freedom, but then came the challenge of encouraging a new family for Merle. In the weeks after his arrival, Merle made new relationships with the other Sulphur mustangs recently arrived at the Sanctuary. He took particular interest in the mare called Courage. It has been a lovely relationship to observe, that between Merle and Courage. They have become partners and made new friends together, almost like creating a whole new family support system among their group. He seems to know where she is even if she’s not next to him. They are…connected…making each other whole. In April, 2016, Merle and Courage, along with their two best friends, Arturo and Miss Sulphur, were given back their freedom as they were released into the vast acreage of the sanctuary’s Spanish field. The following day, they could not be found! Several days later, they were spotted in the next pasture over. From that pasture, they could cross the Cheyenne River into the sanctuary’s 8,000 acres fondly referred to as the Sanctuary’s “wild side.” Indeed, three weeks after their new-found freedom, the foursome was spotted there at the top of the sanctuary. This location is not on the sanctuary’s regular tour route and there are not many fences to restrict their movement throughout the property. It is true freedom for these horses. It is quite possible that Merle and his new family will not be seen all that often in the future. Photo opportunities will be limited and only on their terms, when they decide to be seen. But isn’t this what “sanctuary” is about? These, and all the wild horses at the Black Hills Wild Horse Sanctuary, have their families, their freedom, and they are protected from any threats to these, forever. All because a rancher followed his heart to make a difference all those years ago. Click on the the Black Hills Wild Horse Sanctuary logo above to be redirected to their website. 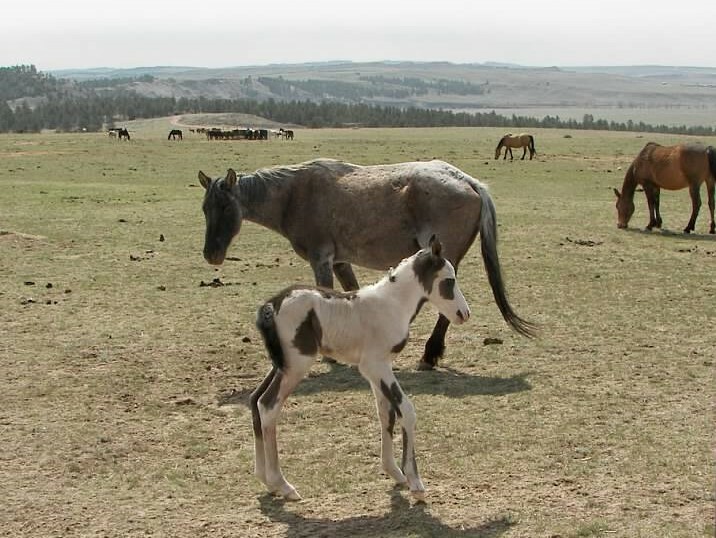 The Black Hills Wild Horse Sanctuary is a program of the Institute of Range and the American Mustang – a 501( c) 3 organization. Tours of the Sanctuary are available daily throughout the year. Please visit www.wildmustangs.com to learn more and support the important work they are doing on behalf of American’s wild horses. Every story has a beginning and an end. Or does it? Life is not that black and white. Life is a series of seamlessly overlapping events that while we are in the midst of them, often make no impression on us, but then, one day, everything falls into place and it is the “AH HA” moment where the lightbulb clicks on. This moment is the culmination of a series of experiences, events, people, ideas, feelings that may have accumulated over days, months, years or decades. However, this moment is not the END event, as if all was laid into place to complete a project; it is part of those overlapping events that writes another chapter in our life. In essence, the “end” is a new "beginning". Many times we cannot change what life has dealt us. But we can write our own stories. The character of a person is shown by how they deal with what life has dealt them. We all have the power to choose how we deal with life. As long as I can remember I always loved Mustangs. I have no idea how old I was or even how I knew about them. I grew up in the suburbs of Syracuse, New York…it wasn’t like I was ever even exposed to horses. But the love for them never diminished. From childhood, to adulthood…it never waned. 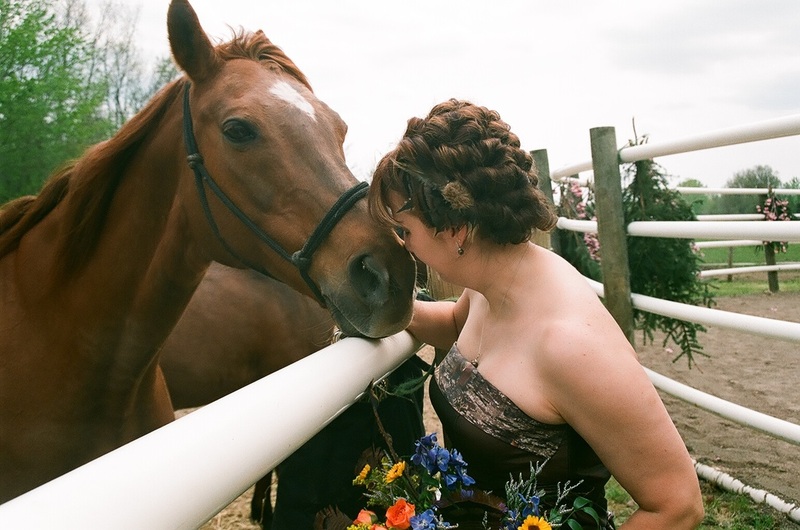 I was never financially in a position to take riding lessons or to have a horse. 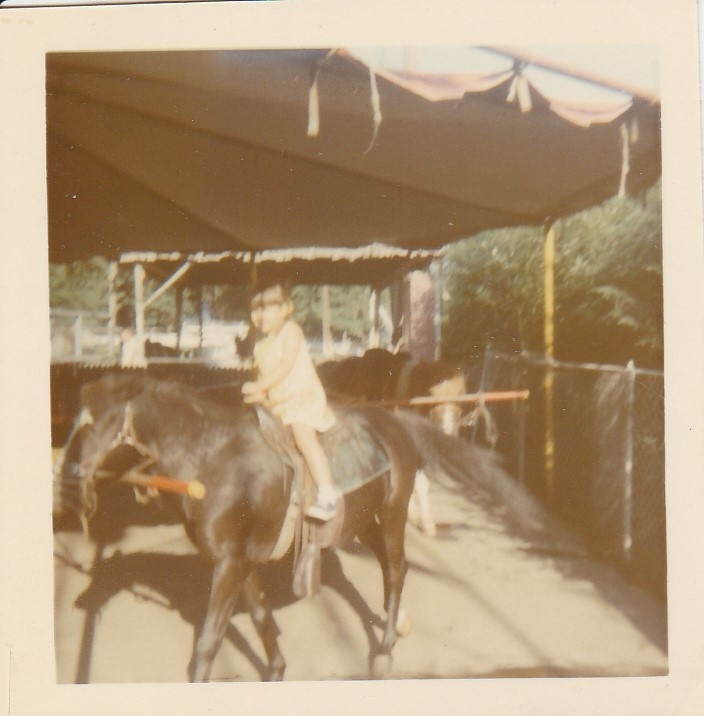 I went on trail rides whenever and wherever I could (which was not very often). Fast forward through college, marriage, divorce, another failed relationship … I now find myself with two beautiful horses and no place to live because I can’t afford board AND rent. My mother who knew me better than anyone in this world ever will said, “Move back home with me so you can keep your horses.” So, I did. While boarding my horses, I met “Summer”. She was the first Mustang I had ever met. She was in a stall, two stalls away from Max. I didn’t know much about her. I didn’t know her story – where she came from, where she was going. I did know that she was scared to death and no one knew how to handle her or relate to her. She had been neglected, probably abused, and most people at that time (this was around 2004) didn’t have a clue about relating to Mustangs (at least not in Central New York). I would spend time outside her stall when I was done with my chores and tending to my horses. I would sit quietly and watch her. She had a kind eye that was filled with fear and uncertainty. It broke my heart. Summer planted in my memory what should never be the life of a Mustang (or any animal). 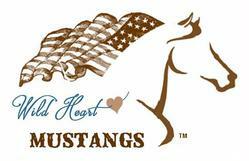 It was her story that planted the seed that grew over a decade to inspire me to start Wild Heart Mustangs™ e-zine. Little Mary Lainhart - hooked on horses! The ember in my soul to have a Mustang grew when I met Buck. I finally met someone who had the same interests as me, who shared my passion for horses. Rather than being jealous of the time I was spending at the barn, he was spending his time there with me. Our family of my two horses, grew to add his two mules. 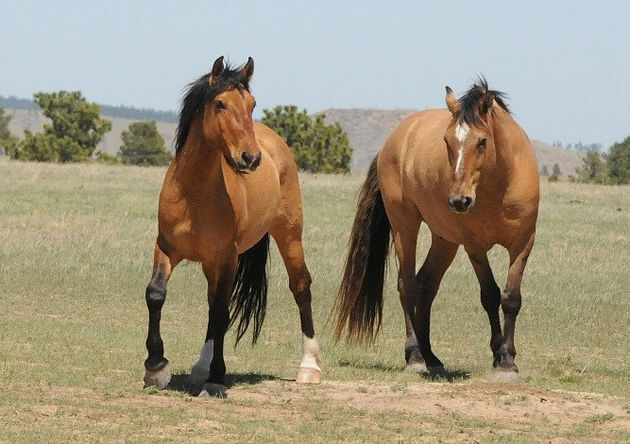 In April 2008 on my first trip out West … it was a dream come true to see wild horses running free at the Black Hills Wild Horse Sanctuary (BHWHS) in Hot Springs, South Dakota. At the time, my oldest horse, Max, had been retired due to ringbone. Jenny was getting up in age. I knew if I wanted to have another riding horses it would take some time to train it to have it ready for when Jenny was ready to retire. Buck said if I saw a Mustang I liked, he would get it for me for my birthday, which was in May. The long and the short of it was one Mustang chose me, Neeheewanna; and I chose one Mustang, Wakan Lakota. By the Fall of 2008 our herd had grown to six. Neehee and Wakan were already gentled and leading before they were delivered to us from BHWHS. Neeheewanna, our first encounter at Black Hills Wild Horse Sanctuary. She was a yearling. Every single one of our animals has had lessons to teach us. Every single one of them, an integral part of our family. Somewhere in my heart, I always wondered, still…what it would be like to have a wild horse and gentle it yourself? But now was not the time for us. Life got crazy, changes in professions, my mom got diagnosed with breast cancer, we started our own business. Now was not the time for us. It was all we could do to get through each day, each struggle, each obstacle. We got married in May 2010. That Fall, Mom’s cancer came back. It had spread. By December, the day before Christmas Eve, she had left this world. I’m not going to lie…it took literally years to get myself together again. She was my best friend, the person who knew my soul. She didn’t always understand me, but she always loved and supported me and encouraged me to follow my heart. In writing this, now, I realize that she passed the torch to Bucky to be my champion, now more so than ever. I have always gone to my animals for my soul. I always related to them far better than to humans. They felt my soul and I never had to say a word. In the past two years, Bucky has had great personal loss in his life. I always prayed that he would find the healing in the animals, like I always did. In April this year, we took an impromptu trip to WY to do some turkey hunting and visit our friend in Cheyenne. As luck would have it, he is friends with a person with a 50,000 acre ranch who was approved by the Bureau of Land Management (BLM) to have a long term off range holding facility for “unadoptable” BLM Mustangs. We were granted permission to go on the ranch so I could take pictures of them. While we were slowly driving down the dirt road in the snow a majestic mare caught Bucky’s eye “1058”. Then words came out of Bucky’s mouth that I never thought I would hear “Call the BLM to find out about her. I would adopt her.” So I dutifully photographed 1058 as my heart pounded and my head raced to think we may actually adopt a wild mustang! 1058 was not available, as she was a much older mare who would live her life out in these beautiful mountains – something that we could never give her if she were to come home with us. But the seed was planted and a door was opened. There comes a time in your relationship when you know when to leave something alone. Now was the time. So I busied myself with focusing on the Ithaca event and seeing the horses there and on getting the word out about the e-zine. I knew if we ever were to get a Mustang it had to be a mutual feeling, we would need to do it as a partnership. It could not be a forced issue, or one that was done without positive energy surrounding it. Friday, June 17th we arrived in Ithaca, NY, set up our table and started meeting people. The reception to the e-zine was remarkable. We happened to set up our table right in view of a beautiful Palomino. Bucky sent me on a mission to find out more about the Palomino. It was adopted on the internet and was there for pick up. It was not available. He couldn’t take his eyes off this horse. There is no doubt this horse was beautiful, but there were a lot of beautiful horses there…in fact, all of them (and the burros too). Another horse caught Buck’s eye…but there was no way she was 15H. 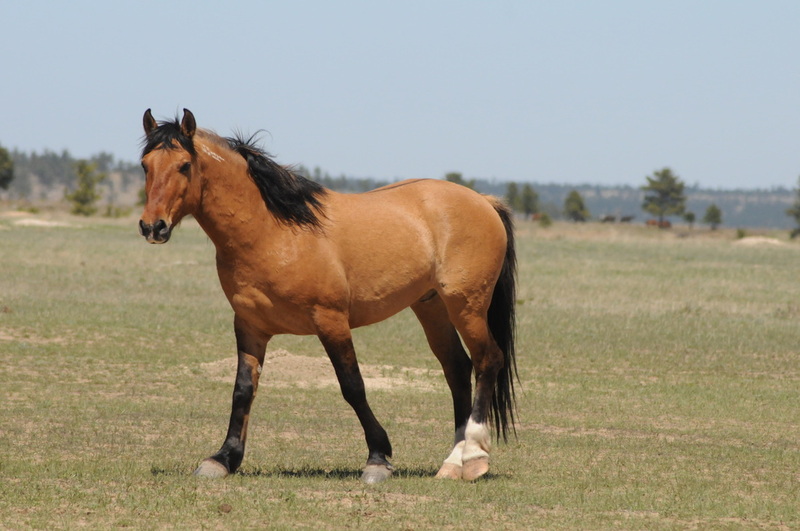 A beautiful, stocky, bay mare …who was also not available and was there for a pick up. I told Buck to put his mind to rest, neither of them were available, so he needn’t worry about going home with a horse. 1408 from Carter Reservoir HMA - now is our "Angel"
Saturday was the pick up day. We met the adopters of the Palomino and two other mustangs – Gretchen Loebel and Jennifer Loebel Knight (read about their Mustangs on Trainer Tips in this issue). They waited anxiously for their transportation to arrive from MA to take their new family home. More horses were loaded, the numbers dwindled. The corrals became more empty. Buck “needed to get up and walk around a bit”. I nonchalantly caught him hanging out with the bay – 1408. He casually made his way back to me and mentioned I should go talk to the BLM to see when this mare was going to get picked up by her adopter. So, devoted wife that I am, I went and asked about her. They couldn’t get in touch with the person. If they didn’t hear back in 20 minutes, she would become available for adoption. I delivered the message to Bucky. I reminded him, that we hadn’t been approved yet, as we never filled out the paperwork intending to come and adopt a horse. So the next request I had was to get an application. Buck filled out the application and disappeared to the BLM Office. A short time later, the application was approved and Buck comes back with a folder from the BLM and informs me that he needs to leave now to go home and get the trailer. He just adopted 1408. NOW WAS THE TIME! Now was the time in our lives to adopt a wild mustang! Bucky was drawn to her in a way I cannot explain. This 6 year old mare who stands 13H high and is built like a power house… is the horse chosen to heal his soul. Chosen by whom? Divine Intervention, I believe. We had a trip planned prior to this. We should have never been there Saturday to begin with. It was a cancellation to our trip that allowed us to be there that day. It was, for whatever reason, the initial adopter who never showed up – that made her available. It was 1058 months before that planted the seed of getting a Mustang. Our special Mustang, a saving grace, our 1408… in her new life, her name is Angel. Bucky had the BLM cut off her neck tag before she was loaded into our trailer. I was kind of upset…to me it was like a milestone, a right of passage to do it ourselves as part of the gentling. Buck had a different way of looking at it. One I had never considered. He said her neck tag represented her past. A life of imprisonment, so to speak. A number, not a being. He saw it as leaving all that behind, her past released from her when her tag was removed. He wanted her new life to begin right then and there, at that moment. So….is this a wonderful ending to a story? Or a beautiful beginning with many curves, hills and valleys to journey together to reach many new destinations along the way? 1408 neck tag removed leaves her old life behind. "Angel" on her way to her new home and her new life. Buck and Angel getting to know each other more and more every day. It has been only over a week since we have had Angel in our lives. She has already made her presence felt. Buck and I are both strong headed, stubborn, Germans. Our favorite saying.... “You can always tell a German, but you can’t tell them much.” Anyone who has seen us work together knows that we are both opinionated and outspoken. In Angel’s presence, we find ourselves with a new demeanor…more listening to each other, softer voices, more trust in each other’s ideas. Buck is finding a quietness in him, I don’t think he knew existed. Angel is curious, alert, smart. She watches and processes everything around her. She comes to us, will eat from our hands, and will allow Buck to casually touch her briefly. She investigates everything with her lips and her nose. She will breathe you in, play with your clothes with her lips and licked my leg the other day. In watching Buck work with her, there is still what I would describe as the 6” forcefield. Once you reach that barrier, if you move towards her an inch, she moves away from you an inch in perfect unison with your movements. On her terms, she is nuzzling you all over, on people terms…she needs more time. 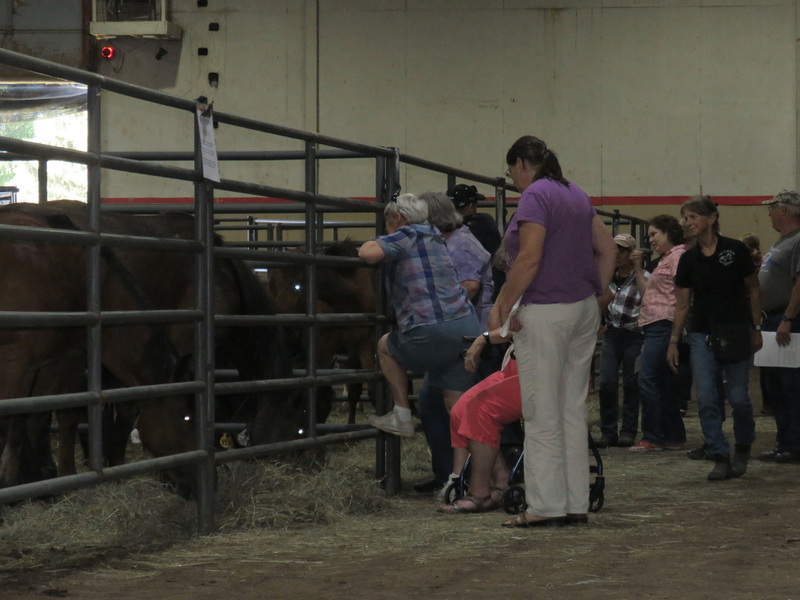 She watches the mules and other horses get pet, scratched, hugged, body sacked while they just stand there enjoying it. She is like a sponge that absorbs everything around her. She has a kind eye that is filled with wonder, beauty, and acceptance. She teaches us to be present when we are with her. The outside world is put on hold. Like entering a sweat lodge, all the negative, the disagreements, the differences are left outside the door. Only positive energy, working collectively, respect, and understanding are permitted once you enter into her space. ​Maybe the ultimate life lesson from a Mustang is to live each moment of your life, as if you are in their presence. Do you have suggestions, questions, or resources to share? We'd love to hear from you, so send us a message.